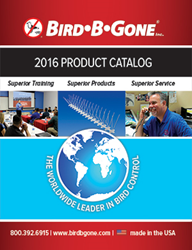 Bird B Gone, the leader in bird control products for commercial, industrial and residential applications has announced the release of its 2016 product catalog. The new catalog will feature a comprehensive array of bird control products and services. Bird B Gone offers the largest selection of humane and effective bird control products in the nation. Underscoring its theme of a "Partner with the Leaders in Bird Control,” Bird-B-Gone is committed to staying on top of the latest advancements in the bird control industry. The company’s 2016 product catalog includes a wide array of products that incorporate new technologies with tried and true methods. Bird B Gone continues to develop the most effective bird deterrents and repellents available. Bird B Gone products have helped solve pest bird problems in commercial, industrial and residential venues worldwide since 1992. The number one manufacturer and supplier of bird control products, Bird B Gone recently celebrated the 16-year anniversary of one of the most effective and humane bird deterrents ever devised—the original Polycarbonate Bird Spike. The new products featured in its 2016 catalog significantly enhance the company’s pest control offerings. Bird B Gone products are humane, effective and carry industry-leading guarantees. They are the most specified products by architects, engineers and government agencies. Bird B Gone bird deterrents and repellents have been used to successfully control pest birds at such high-profile locations as airports, schools, hospitals, military bases and historical buildings. The company’s bird control engineers have over 90+ years of combined experience. Most bird control products are manufactured at the company’s US facility to ensure high quality and competitive pricing. They offer same-day and express shipping, even on custom cut netting. Their products are available worldwide through a network of distributors. Bird B Gone also offers training and support for all aspects of bird control, including on-site training and technical support. The company regularly hosts training courses at Bird B Gone University, which provides comprehensive instruction in everything from quoting a job to product installation. Bird B Gone is the world’s largest manufacturer and distributor of bird control products, providing effective and humane solutions to a bird-free environment. The company provides advice; training and installation services for those who need help with these and other bird control measures. For the complete line of products from Bird B Gone, call 1-800-392-6915; fax: 949-472-3116 or visit our website at http://www.birdbgone.com, e-mail: nobirds@birdbgone.com.